Here are our top spots for sipping wine while drinking in the landscape. Mendoza is more than spectacular mountain peaks towering over thousands of acres of sprawling vineyards of Malbec, the region's signature grape. Over the past 15 years, this desert wine region has evolved into a top destination for wine tourism. Here are our top spots for sipping wine while drinking in the landscape. 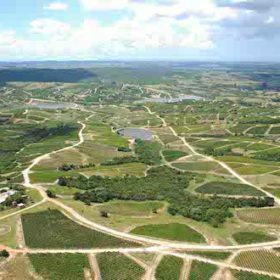 Deep in the southern reaches of the Uco Valley, in the San Carlos district, is O. Fournier (pictured), whose visionary winery has been called the "Flying Saucer." Taste wines over lunch or dinner at the Urban restaurant, where you can look out onto a stunning desert landscape. 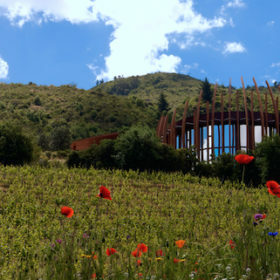 Atamisque is a French-owned winery situated near the town of Tupungato whose claim to fame is its trout farm, along with a restaurant that cooks the fish to perfection. The property includes four modern casitas should you want to spend the night, as well as a par-3 golf course. Bodegas Salentein is Mendoza’s signature winery in terms of architecture and landscaping. Its visitors’ center is home to the Killka art gallery, a tasting lounge and restaurant. Pulenta Estate in the Alto Agrelo district offers visitors a chance to put on a blindfold and try to identify 15 natural aromas commonly found in wine. Bodega Norton in Perdriel provides several tasting opportunities. One of the best is the Empanadas y Vinos tour that includes several wines served alongside a trio of clay-oven-baked empanadas. The winery’s La Vid restaurant is quite good and emphasizes local favorites like empanadas, pastas, salads and lamb chops. Vines of Mendoza operates a tasting room and “blending lab” in the heart of Mendoza city. Come and taste wines in flights or try to blend like a winemaker (reservations required).